Trencadís - What is it and where can I find it in Barcelona? Trencadís – What is it and where can I find it in Barcelona? Trencadís may not be a word that you’re not familiar with, but if you’ve visited Barcelona before, you will certainly have seen it around you in the streets, in buildings, in parks, in souvenir shops… These mosaics are an explosion of colour, each little piece uniquely different in shape, pattern and colour scheme, yet when pieced together they come and form one cohesive and magnificent artwork. Not to mention, Trencadís is absolutely captivating when glittering under the Barcelona sun, as the light bounces off the tiles and brings the vibrant colours to life. It is no wonder that this technique has become synonymous with Mediterranean culture and design. Trencadís is a Catalan term that literally means “chopped” and is the name for this artistic method that was popularised in 20th century Catalan modernism by artists like Antoni Gaudí and Josep Maria Jujol, Trencadís is a mosaic-like effect, achieved by cementing together random shards and pieces of broken chinaware, piece by piece like a jigsaw. Sometimes other materials are used, like glass, buttons or shells. In French, this technique is known as “pique assiette”, which translates to “plate thief”, perhaps referring to the use of recycled or “scrounged” materials – in other words, materials that ceramic factories often discarded. What is the origin of the Trencadís? Well, legend has it that Gaudí was visiting the ceramics workshop of Lluis Bru, and when he saw how tediously slow he was putting the pieces together, the impatient Gaudí simply grabbed a tile, shattered it into a hundred pieces on the ground, and stuck them on by the fistful, exclaiming “We must do it like this or we’ll never finish!”. Whether or not the story is true, it is true that the Catalan architect certainly used the innovative craft extensively and transformed it into one of his most signature techniques, which he applied in many of his architectural creations in Barcelona. Where can I find Trencadís in Barcelona? 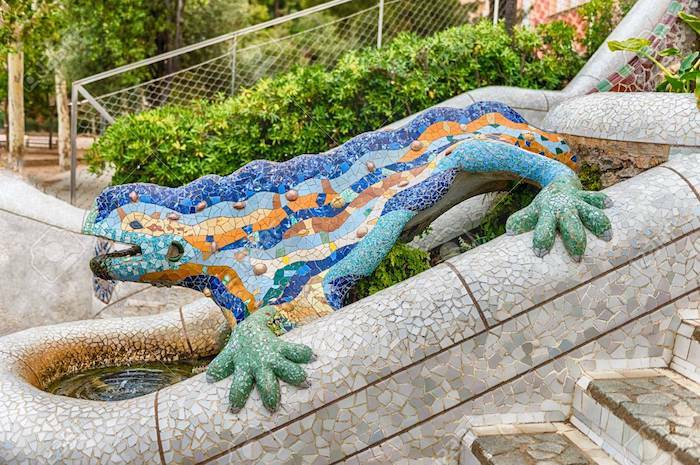 One of the most famous examples of Trencadís is brought to life, in the form of the world-famous mosaic, affectionately known as “El Drac” that majestically lazes on the steps in Park Güell. Also, the pavilion seating area in Park Güell, where you can get a panoramic view of Barcelona, is adorned in multi-coloured mosaic tiles, and is a popular photography point for visitors of Barcelona. Throughout the park you’ll find the distinctive artform of Trencadís-covered spheres, columns, and buildings too. 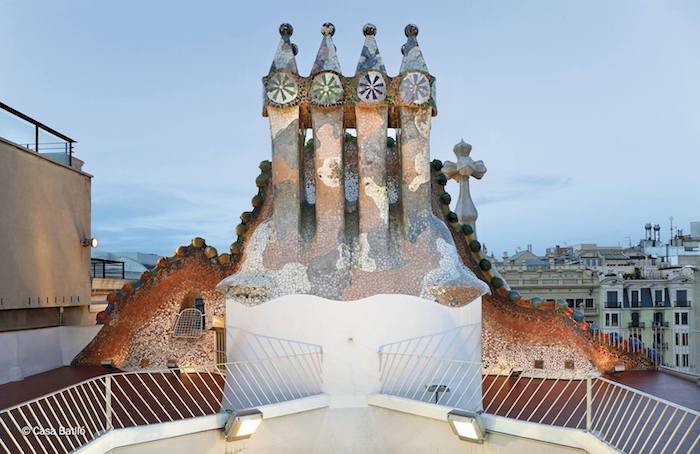 The colors that predominate in the work are blue, green and yellow, which for Gaudí symbolized Faith, Hope and Charity. One of Gaudí’s other Trencadís masterpieces is Casa Batlló on Passeig de Gràcia, which when illuminated during the nighttime almost comes alive with magic, glowing and shimmering in the dark. Even the stone benches that line the luxurious shops on Passeig de Gràcia are covered in the signature mosaic tiles. In Sant Pau, mosaics were used everywhere to introduce floral motives into the hospital, and can be found in murals, on the ceilings, floors and walls. On the floor of Parròquia de Sant Pacià, a geometric design of marble mosaic lies on the floor, created by a young Gaudí. With Trencadís found on many different architectural creations in Barcelona, just keep your eyes peeled while wandering around, and you’re sure to stumble upon another mosaic-covered beauty. Did you find any that we missed out? Let us know!